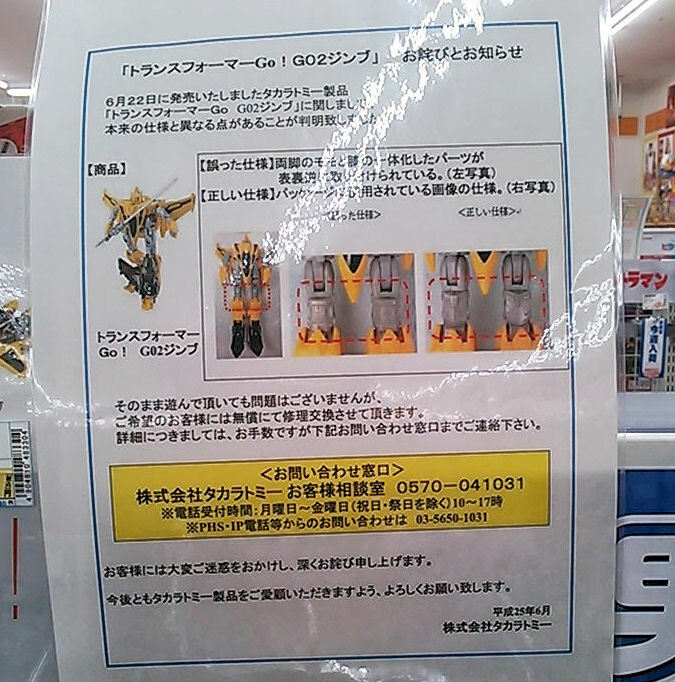 TakaraTomy have issued a recall and replacement of Transformers GO! Jinbu due to a factory mis-assembly of the thighs. This mis-assembly causes the knees to not be able to bend the correct way and therefore, the combined modes arms do not bend the correct way either. Unsold stock has been recalled and customers (in Japan) who purchased the figure can return it for a correctly assembled replacement which will be available from mid-July.If one chooses not to return their figure, the error can be corrected by disassembling and reassembling the figure but there is the risk of misplacing parts like springs etc. There is a picture attached for those who need to reference and check any figures they have in hand currently. Super easy. My only other tip is to make sure to use a screw driver that won't strip the screws. When has Hasbro put a piece on incorrectly on a whole run of toys, I would be interested to know, now I know they have had pieces that don't work well. Relieved to hear that it's an easy fix. Will be doing that once I have mine. Is it the same part just turned around or what? Just to clarify… The part that's reversed actually houses the ratchet for the leg. That means that you have to take out two screws for each shin/foot (the big yellow piece), and then one screw on each knee piece. Six screws total. Then you have to swap the knee pieces. So the one that was on the left side winds up on the right leg, and the one from the right winds up on the left. 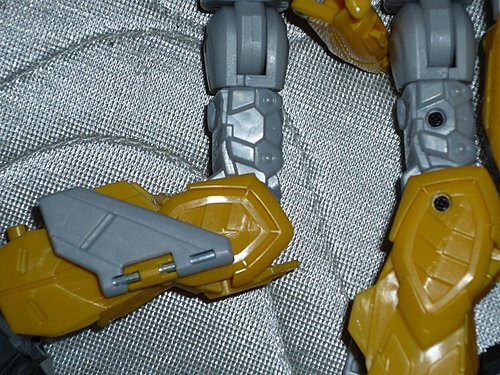 Then you can re-assemble the shins/feet on the same sides they were originally on. So, all you're doing really is just swapping those two knee segments from one side to the other. It's really very simple! You just have to watch to make sure the spring and ratchet pads from the knee joint don't wander off during disassembly. So, um, how does this affect orders in the HLJ warehouse? At the very least though, I WILL say that at least they're being pretty up front about dealing with the problem. Plus, for anyone who's taken apart a toy before, odds are it should be easy to manually do the fix. mines there too until GT Megs comes out. I'm getting an e-mail from AmiAmi saying my June order is ready today or tomorrow more than likely, I would imagine they'd take him out of the order if they weren't allowed to sell it. I would be really disappointed if so, I'd rather have him now with backward pieces than not at all or later. I think the idea is to make it so he has elbows when in arm mode. – Hardly a big deal if people barely noticed the error though. The arms swing both ways regardless – they're on unlimited ratchets. With the knee around the other way, they might bend a little bit FURTHER, but it's not like they weren't bending before. Others have said – and I think this makes more sense – that this affects his torso combined mode more. Before the swap, there wasn't really enough leeway to move his shins back far enough. Hopefully there is now – I haven't had a chance to check. It seems to prevent the figure from doing a full 90 degree knee bend. Ah, so this is why it's so difficult to keep everything tabbed in place in combined mode. Thanks man! Ah, righto. Fair enough then, that'd obviously affect combined mode arms posability. Doesn't look major, does it affect how the toy works at all, aside from looking wrong? Looks to be an easy fix. Transformers GO G02¨³ªZJINBU°¦¸}©}*ø¨ì90«× – ¤é¨t*^¶¯¢A¾÷±ñ¤H°Q½×°Ï – Toysdaily ª±¨ã¤é³ø – Powered by Discuz!!! Second pic shows the wrongly assembled thighs and the third pic shows the corrected ones.